The Chevrolet Blazer is back. To dispense with the obvious, this isn't the grandfatherly, old K5; that square-bodied hulk of a convertible SUV has no place in today's world, sadly. Nor is it the simple S-10, whose rugged pickup frame is out of step with major market trends. 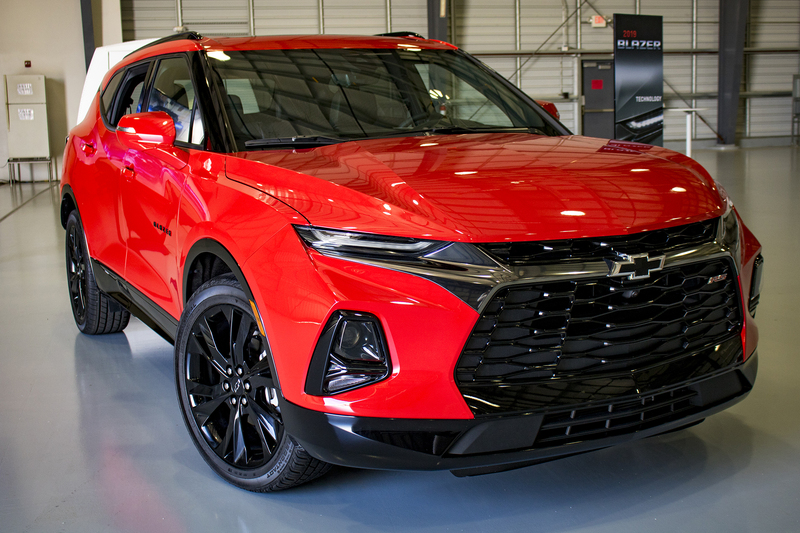 Instead, the 2019 Chevrolet Blazer is a smooth-riding politico with a pro-pavement platform that aims to be the midsize, two-row crossover for the people. Cynical? Maybe. It's impossible that General Motors approved the Blazer's modest reincarnation without considering how the die-hards of the truck world would respond—and with the rival Ford Bronco returning as a real off-roader, it's fair to wonder about the path less traveled. But the masses have spoken. Midsize five-seaters are the second-biggest and second -fastest-growing SUV segment, so that's what GM is turning the Blazer into. Still, the 2019 Chevrolet Blazer deserves to be judged on its own merits—I say this as one of the die-hards—and thankfully, it (mostly) delivers. Were it named literally anything else, we could skip the whole heritage vs. sales debate and just talk turkey. In that spirit, the new Blazer is fine crossover with surprisingly sharp handling and a style all its own. In fact, I'd venture to say it delivers the most car-like ride of any crossover in its class. That focus is befitting of its task. "This is not about climbing the cinderblock mountain," lead engineer Larry Mihalko told me. "What we've done is try to maximize on-pavement handling." Ultimately, he says, the 2019 Blazer is a vision of what might one day replace the sports sedan, a withering space that Chevy abandoned following the death of the SS in 2017. No one is saying the Blazer was built to set any lap times. But just how far did GM go with this particular mission? Since the 2019 Chevrolet Blazer is a little late to the midsize two-row segment—think of how long the Ford Edge, Nissan Murano and Jeep Grand Cherokee have been there, and now the Honda Passport is back as well—GM hopes a healthy dose of singular style will draw buyers in. The low, angular front end goes heavy on horizontal lines to accentuate the Blazer's width, bookended by headlight stacks with large projector lamps and thin slits for daytime running lights, as is the trend these days. 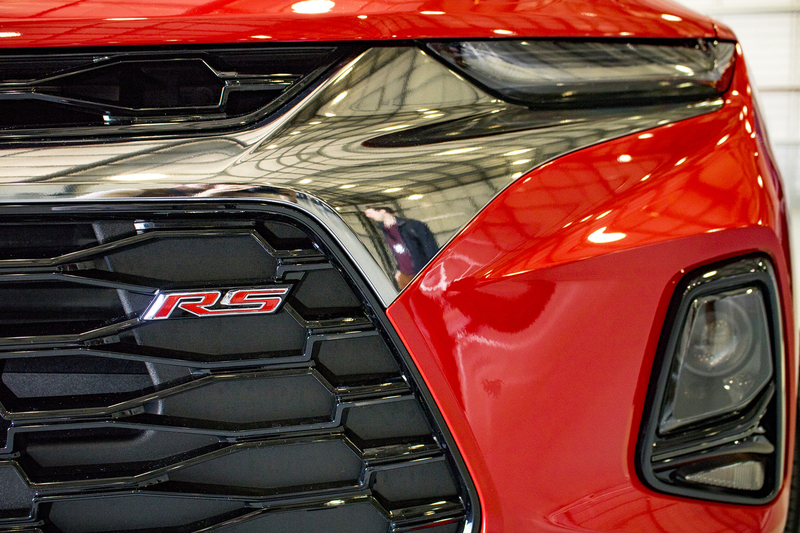 RS and Premier trims are well-distinguished with blacked-out and chrome accents, respectively. The overall belt line stays mostly flat as it travels back towards the rear, before kicking up dramatically just aft of the C-pillar. There's a bit of Infiniti QX70 in the profile, especially in the long hood and slightly sloping roof. 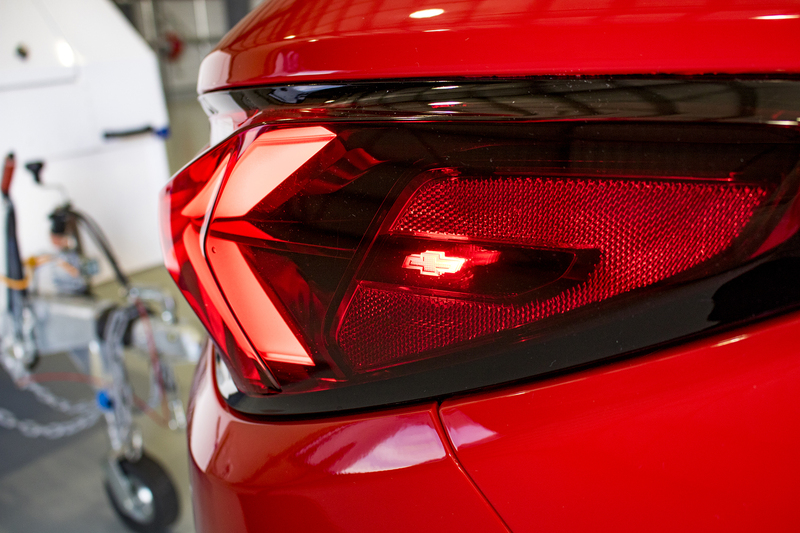 If you're thinking that thicc D-pillar impacts rear visibility from inside, you'd be correct; Mihalko says it's a stylistic decision, not an engineering one. Whatever the reason, it doesn't add enough to the look to make it worth the functional tradeoff. Still, the rest of the 2019 Blazer is well-executed. Riding on the same C1XX platform as the Cadillac XT5 and GMC Acadia (a stretched version underpins the Chevy Traverse), it's smaller in every dimension than those, with the most deviation in length and least in wheelbase and width. That has the effect of pushing the wheels towards the corners, which in turn gives it an athletic presence in person. You'll either love or hate the high-design front end; as a complete package, it's calmer than the Murano, sharper than the Edge, and sportier than the Grand Cherokee. If the outside of the 2019 Blazer is a familiar band playing an experimental new track, then the inside is the surprising cover of a cross-genre hit. 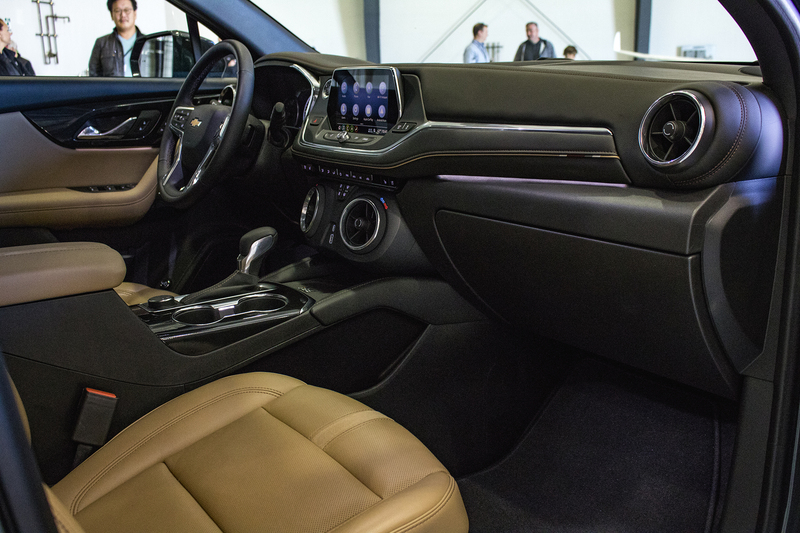 The dashboard design is lifted wholesale from the Camaro; yes, there are a few differences in the gauge cluster surround and trim placement, but look at it. That hexagonal motif, the button layout, those circular HVAC vents with temperature control integrated into the bezel—it's all straight out of the 2019 'Maro. 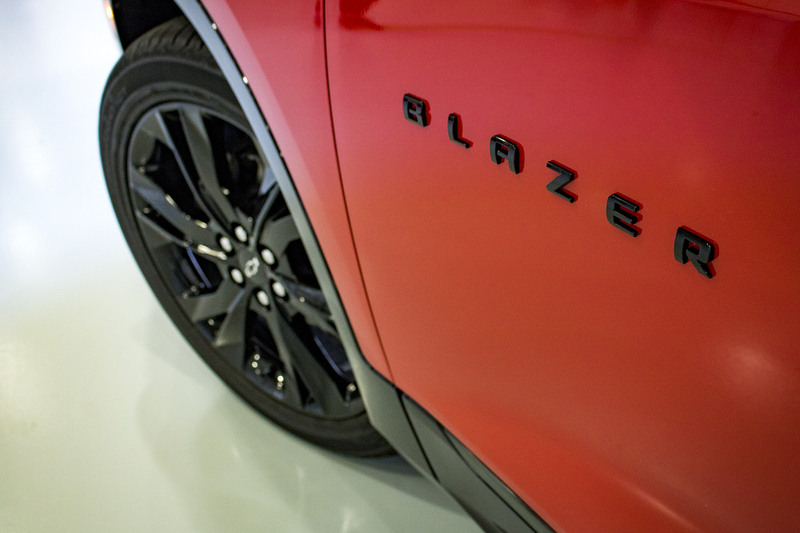 From a materials standpoint, the Blazer mostly exceeds expectations for a midsize Chevrolet. 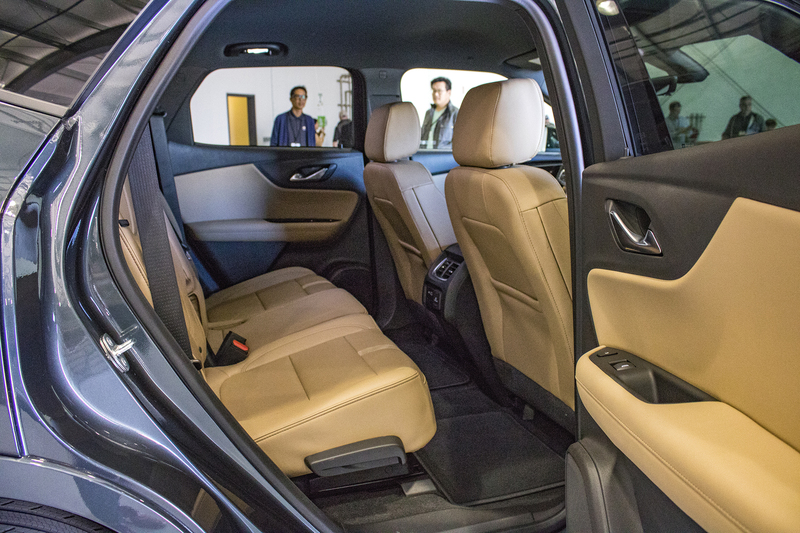 Even the base model gets a leather-wrapped gear shift and steering wheel, for example, and the Premier trim offers a handsome tan maple sugar/jet black color combination that looks genuinely nice. 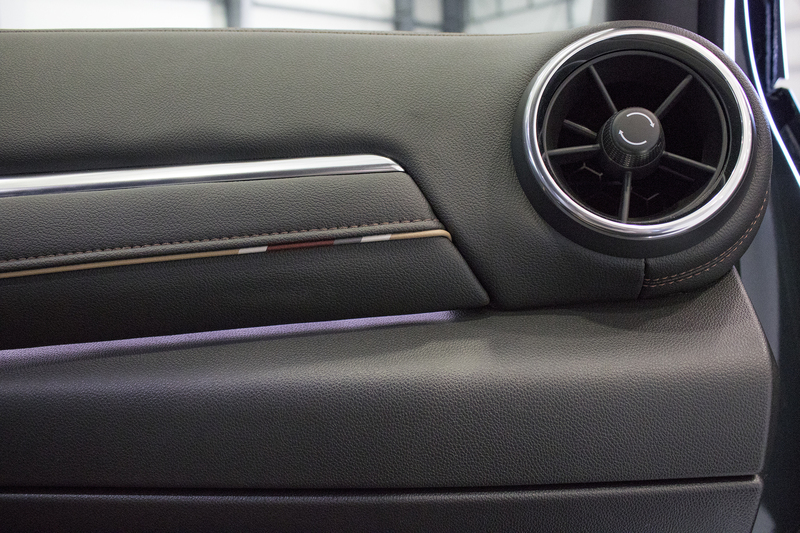 Backlit USB ports and subtle color accents on the dash trim and seats are thoughtful touches. Throw in the panoramic sunroof, and you've got a very pleasant place to pass the miles; nothing feels overwrought or underdone. But borrowing so heavily from the Camaro means it doesn't feel that special either, and there's no explosive V-8 to distract you from quirks like the downward-tilted infotainment screen and the liberal use of black plastic, even in the higher trims. 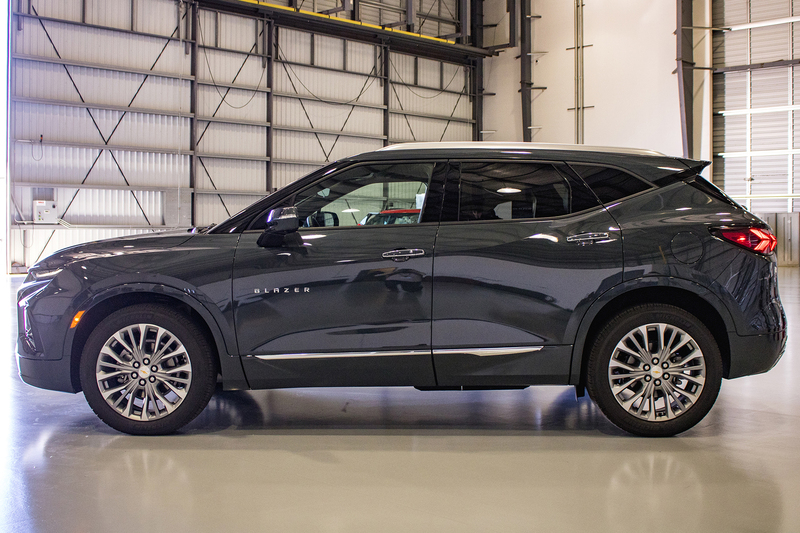 Of course, the 2019 Chevy Blazer has far more capability than your uncle's I-ROC: 30.5 cubic feet of space behind the rear seats, and 64.2 cubic feet with them folded. Unfortunately, that's less than every one of those rivals listed above, and only a smidge more than the smaller Chevrolet Equinox. Blame the sporty profile. More germane to most buyers than maximum cargo volume will be the active safety features and infotainment on tap. The former are mostly optional, with only the rear seat reminder and required-by-law backup camera standard on the base model; even on the RS and Premier, only blind spot monitoring, rear parking sensors, and rear cross traffic alert are free. In an age where things like adaptive cruise control, automatic emergency braking, and lane keep assist are increasingly offered as standard, their exclusion is a head-scratcher on a vehicle whose most expensive trim starts at $44,000. 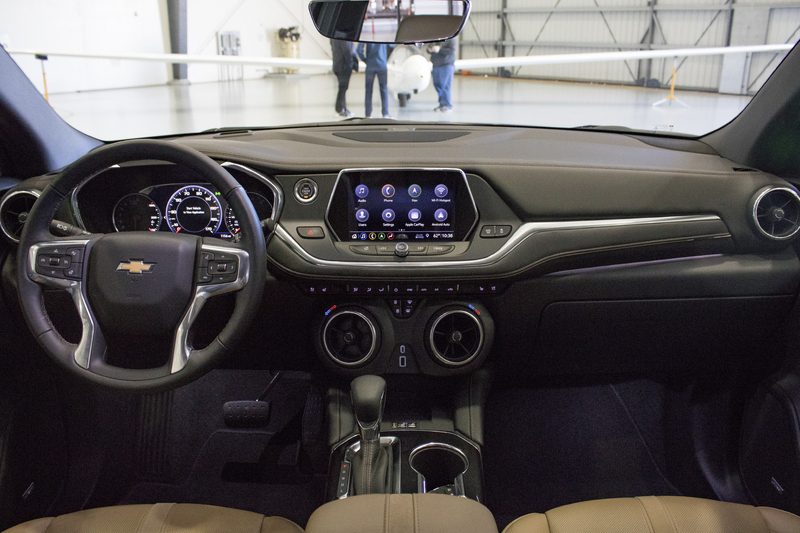 The new and smartly-named Chevrolet Infotainment 3 system is crisp, clean, and easy to use, highlighted by the 8.0-inch screen's zippy response times and the easy-to-navigate favorites bar at the bottom. Its software is now capable of saving individual driver profiles to quickly load things like climate settings and radio favorites. You're still probably just going to use Android Auto or Apple CarPlay, but it's nice to know things have greatly improved here. Two engines are available: a 2.5-liter inline-four with 193 horsepower and 188 pound-feet of torque, and a 3.6-liter V-6 generating 308 horsepower and 270 torques. Both are connected to a nine-speed automatic transmission. Realistically, most people will end up with the V-6; opting for the four-banger limits you to front-wheel drive and a skimpy options tree, while the lowest six-cylinder model (simply dubbed "Blazer 3.6L") unlocks a few more options. That focus does pay off; riding on a MacPherson strut front and a five-link rear, the Blazer is noticeably composed when hustling through a curve, staying flatter and carrying more speed than most crossovers dare to dream of. Even with a transmission geared for fuel economy instead of fun, there's real joy to be found at the Blazer's limits—which, admittedly, real owners will likely never probe. The $42,000 RS trim throws in some sportier dampers and quicker-ratio steering; cursory upgrades, but upgrades nonetheless. Astute observers will recognize that this is the same naturally-aspirated 3.6-liter V-6 as found in the base Camaro. Peak horsepower doesn't arrive until 6,700 rpm, so go ahead and wring that laid-back sucker out. It's surprisingly hard to upset the chassis, with understeer being the biggest risk of really pushing it. (The AWD system runs primarily in front-wheel-only mode until rear slip is detected.) Neither the Sport nor Off-Road driving modes, which modulate throttle response, braking, and yaw control, make a huge difference to what is already an above-average handler that could just use a little more power. 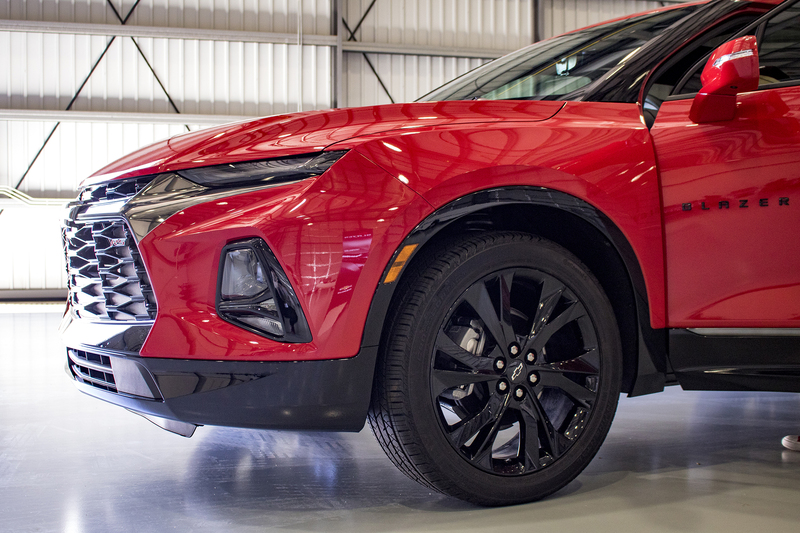 One of the bigger surprises is that the 2019 Chevrolet Blazer can still tow 4,500 pounds with all-wheel-drive, despite its move to a unibody structure. Impressive, though that kind of load will likely do a number on the so-so EPA fuel economy ratings of 18 miles per gallon city and 25 mpg highway. 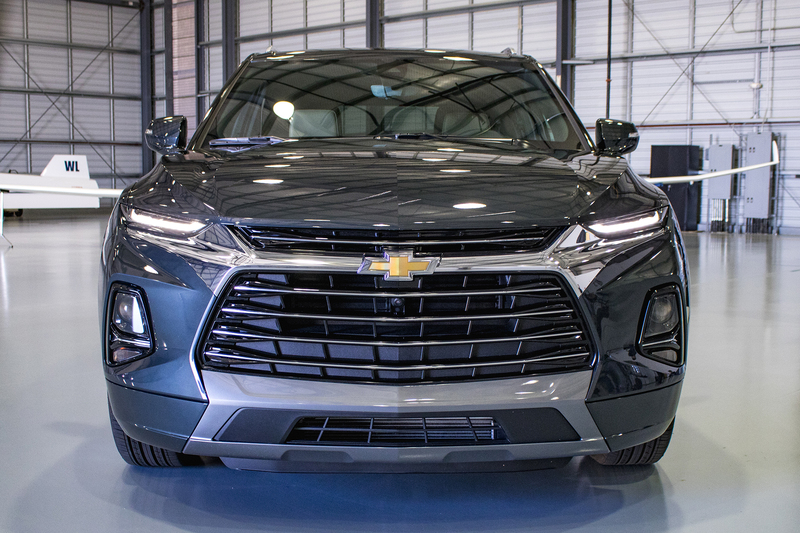 Setting aside the emotional baggage wrapped up in using that name, the 2019 Chevrolet Blazer is a solid midsize SUV that goes farther in providing a car-like driving experience behind the wheel than anything else in the segment. That alone should move the needle for some; if Chevrolet is correct in believing style is one of the biggest motivating factors for those seeking a five-seat crossover of this ilk, the Blazer has more than one strong arrow in its quiver. If anything is to trip it up, it's not the forceful opinions of K5 owners like myself, or those eyeing the new rough-and-ready Ford Bronco with glee. No, like with most new cars, it's the price that requires a warning. To take just one analog, a $43,000 Ford Edge Titanium AWD offers heated and ventilated leather-trimmed front seats, heated rear seats, a panoramic sunroof, wireless charging, a fancy Bang & Olufsen sound system, voice-activated navigation, and Ford's CoPilot 360 Assist+ that brings every active safety feature under the sun. To get the close to the same content on the Chevrolet Blazer AWD Premier requires spending over $51,000. Of course, you get a more durable V-6 engine, a better all-wheel-drive system, and a newer, tighter chassis—plus, you know, something approaching visual interest. Whether or not that's worth the upcharge is an open and subjective question that will have to be answered by buyers themselves. I'm inclined to say not quite, for now—but that could be the die-hard in me talking. We'll find out either way when the first sales figures trickle in next month. The old, capable Grand Cherokee is still the most balanced rig for adventures big and small.